Temperatures are back to winter again, and we did pick up about 2" of new snow to put a nice surface back on the snow after the Thursday/Friday thaw. Cold through Tuesday, then warming a bit with some chance of rain, but cooler again by next weekend. Clearly no meltdown in sight, so keep on skiing. ​ After two days of high temperatures, the weather has cooled down. We picked up a dusting to 1" overnight, but should get another inch or so by Sunday morning. After that, temperatures only in the upper 20s through Tuesday, but then again warming up later in the week with a chance of rain as well. Unbridged brook crossings will be a challenge even after the waters go down because any brook that "went out" will be flowing in a deep trench. Of particular concern would be the crossing of Marcy Brook at Indian Falls on the Marcy trail. The other questionable crossing will be the Opalescent River in Flowed Lands, but there at least one can stay on the hiking trail to get to Lake Colden. ​ Most areas still have a good base. Skiing today won't be that good, but should be much better Sunday to Tuesday at least. As noted in the previous report, it is now "spring conditions" so until the snow melts a lot more the controlling factor will be temperature. There will be some isolated bare spots on southern slopes and in open areas where earlier winds earlier blew much of the snow away, but these shouldn't require too much walking to cross. Remarks - no reports yet on any section that has bare spots, but they should be small given how much snow we started with. 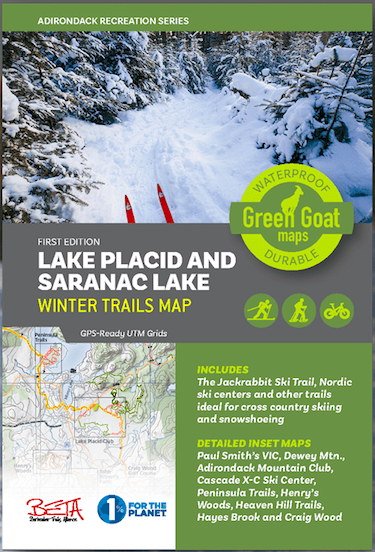 Good cover on all backcountry trails in the High Peaks and most other popular routes. Surface conditions will vary from fast downhills where it had been packed out to a more forgiving crust on unbroken areas. Johns Brook trail from the Garden was skiable with care, but no longer recommended after the thaw. Road to Lower Ausable Lake still had snowmobile traffic until this thaw, but is still very skiable with just the inch or so of snow on the old tracks. Boreas parking area again plowed with good cover. No report on how much new snow there or in Newcomb. SKIS OR SNOWSHOES ARE STILL REQUIRED ON ALL TRAILS IN THE HIGH PEAKS AND ABSOLUTELY SHOULD BE WORN ELSEWHERE - BOTH FOR YOUR OWN SAFETY AND TO PRESERVE GOOD CONDITIONS FOR ALL OTHERS. Remarks - Lake Placid Loppet on Saturday will close part of the area. All open on Sunday. Remarks: Snowshoes recommended today. Good skiing Sunday with another 2" expected. The forecasts remain consistent that today, Thursday, and again on Friday will see temperatures in the 50s. This won't be an extended thaw, however, and even these two very warm days won't diminish the snow depth very much in most areas. South-facing slopes at lower elevations will likely become bare, but the Jackrabbit Trail, backcountry trails, and the groomed centers will retain plenty of snow for the coming weekend. While its a bit early to tell just how much, we will get some new snow as it cools down on Friday night and into Saturday. This will mitigate what otherwise would be hard, frozen granular surface conditions. Then highs only in the 20s Sunday and Monday before it again warms up to the upper 30s on Wednesday. So, it looks like we have enough base (5' at Lake Colden and 6-7' at higher elevations) for an extended season of spring skiing. As always, conditions can vary widely from hour to hour as the day warms up and softens any surface that froze up overnight, and this report won't try to keep up with these changes. Watching the weather for predicted temperatures will be the best way to know what any skiing will be like. Update again on Saturday when we know how much snow actually fell overnight. Sorry about no update on the promised Thursday, but there really wasn't anything that had changed since the previous report. Still nice powder surfaces, jackrabbit Trail fully skiable, 60+ inches of snow at Lake Colden, and all X-C centers in full operation. The only change to report now is that it now appears that Sunday's threatened rain will be all snow. Not the nice light powder we've been enjoying for the past two weeks or so, but hey, wet snow is better than wet rain any day. Continued cold through mid week, but then significant warming trend on Thursday and Friday. Friday may see temperatures topping 50, but cooler on Saturday, so no final meltdown of this nice base we've managed to accumulate. That's it for now. Not really much to update since last week. Temperatures have remained below freezing, we've picked up a few more inches of snow, and all popular ski routes have been broken out and have great conditions. The popular routes broken out include the seven mile ski to Boreas Ponds, and the parking area is again plowed. Don't miss this opportunity to see that view when one can additionally ski out onto the ponds for a wider view. Mid-week will see true mid-winter cold with temperatures Wednesday and Thursday only reaching to low teens after a below zero start. Friday is upper 20s, and Saturday will actually be close to 30. Unfortunately, the warming trend continues into Sunday with the dreaded "R" word again in the forecast. Sunday, however, is a long way off, and we will monitor the forecasts and provide an update - probably on Thursday, 3/7. ​ The rain on Sunday didn't reduce the base by very much because it immediately turned around and snowed 3-4" on Monday. Very high winds on Monday caused drifting while also blowing some areas clean, so not every area has been "restored" after Sunday's brief thaw. So far, not much evidence of downed trees - maybe earlier high winds brought down anything likely to come down. Nevertheless, be careful on any downhill if you don't know that it is fully clear. And we always appreciate those who pause to toss errant branches aside. Continued cold on Wednesday with highs only in the low teens. Warmer on Thursday, then 30s on Friday and Saturday with a chance of some light snow. 20s on Sunday, then highs just barely reaching 20 on Monday and Tuesday. Winter is still in full force in the Adirondacks even as the World Nordic Championships in Austria are are going on with temperatures in the 50s. Remarks - Given the winds on Monday and Tuesday, some areas could have been blown down to the frozen granular, and in any event all hills will be quite fast. Otherwise, good, solid cover on the entire trail. Snow depth at Lake Colden: 55"
Good cover on all backcountry trails. Surface conditions will vary from fast downhills where it has been packed out to breakable crust on unbroken areas. As noted above, the wind may have blown some of the new snow off in places, leaving nothing but frozen granular surfaces. Likewise, trail breaking may encounter some deep drifts. Johns Brook trail from the Garden was skiable with care, but Keene Valley only received an inch or so of new snow on Monday. Thus it is "dust on crust" with a few rocks still showing. Road to Lower Ausable Lake still has snowmobile traffic, but is otherwise very skiable with just the inch or roof snow. SKIS OR SNOWSHOES ARE REQUIRED ON ALL TRAILS IN THE HIGH PEAKS AND ABSOLUTELY SHOULD BE WORN ELSEWHERE - BOTH FOR YOUR OWN SAFETY AND TO PRESERVE GOOD CONDITIONS FOR ALL OTHERS. Off track snow depth - 16"
Saturday was a beautiful day. Lots of skiers out on the trials, hope you were one of them. As predicted, Sunday has become quite windy with temperatures in the 40s. No significant loss of snow expected, and now 3-5" of new snow on Monday to restore the surfaces. On the other hand, these winds will likely bring down some trees and branches, and it could be a few days before this new blowdown has been cleared, so be cautious before "letting it rip" on the downhills unless you have already been up the same trail. Following Monday's snow, the temperatures will plunge with highs not reaching 20 on Tuesday and Wednesday. A little warmer on Thursday through Saturday, creeping above freezing on Friday. A more complete report on Tuesday when we may know of the extent of storm damage and what the groomed centers have been able to do with this latest weather cycle. We continue on our temperature "roller-coaster", but fortunately nothing that will diminish to any great extent out existing snow cover. Temperatures in the low 30s on Friday, a bit warmer on Saturday, and then 40s briefly on Sunday with chance of some brief rain. Then cooling off, with highs during the middle of the week only in the low 20s. Surface conditions currently are quite fast "ball-bearing fast" in some spots, and with a slight breakable crust outside of the packed areas. Conditions will slow a bit as temperatures warm during the weekend, but should never become all that slow. No significant new snow in the forecast. Remarks - Longer sections, Old Mt. Road and McKenzie Pass, broken. Good cover on all sections. Still quite fast on the downhills, but not as fast as a few days ago thanks to a bit of new snow. Johns Brook trail from the Garden now skiable with care as there are still a few rocks showing. Inches New Snow - 1"